Vettu cake aka Fried Sweetened Dough is a popular tea stall snack, available only in rural Kerala. Its hard to find this snack in the urban towns. 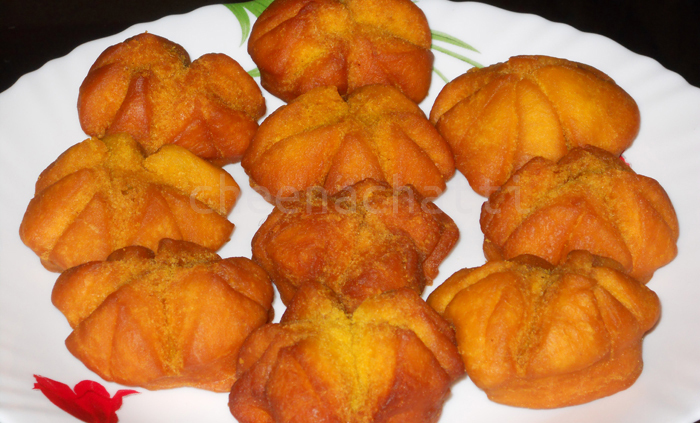 But with this recipe you can prepare vettu cake in your kitchen easily. In a bowl beat the eggs along with sugar until it dissolves and keep it aside. Sieve the flour, semolina and baking soda well into a pan, add beaten egg – sugar mix, milk and warm under very low flame. Mix well using a spoon and turn off the flame and allow it to cool. Add salt, cardamom powder to the pan and make the mixture to a smooth dough (consistency like that of chappathi). Keep the dough covered for around 45 minutes. Shape the dough into a log shape and then cut them into 2×2.5 inch square pieces. Make a “X” (cross) mark in the center using a sharp knife. Boil oil in a pan and turn the flame to minimum. Fry each piece in minimum heat for about 4-5 minutes flipping them in between to ensure uniform cooking. Once cooked transfer the vettu cakes to a plate with tissue paper to remove excess oil. Your vettu cake is ready and serve it with tea. Lower the flame to minimum otherwise inner dough will not be cooked properly. This entry was added on June 7th, 2013 by Renoos in Bakery and tagged with easy vettucake, how to make vettucake, nadan snacks, evening kerala snack, kerala vettucake recipe, kerala snacks, nadan palaharam, evening snack. Last revised on April 1st, 2018. @Smokykitchen : thank you for stopping by and trying the recipe. Will wait for your feedback..
Why do we need to keep the flour mix in the stove? won’t it get cooked even if you keep it in the low flame? At which step you got confused Neela? 2.Sieve the flour, semolina and baking soda well into a pan, add beaten egg – sugar mix, milk and warm under very low flame. 3.Mix well using a spoon and turn off the flame and allow it to cool – this is the step I got confused as you told to keep it under low flame. Not sure why the confusion happened Neela. In step 2, we have to sieve the flour, semolina and baking soda into a pan. Mix it well and then add beaten egg – sugar mix and milk. Then we will warm it under low flame with constant stirring (step 3) and later on we will allow it to cool. Looked for this recipe for so long – and finally got it. Thank you!! I remember my grandma in Kerala always having these made and stored for us – I mean that was over 40yrs ago. I hope to make it this weekend to see if I can get the taste close enough to her cakes!